Why Do Athletes Get Skin Infections like Foot Fungus? The very nature of athletics predisposes a person to skin infections and foot fungus. If you think about it, what does fungi need to survive? They prefer dark, warm, moist environments. They can find the ideal habitat inside an athlete’s shoes, where sweat is harbored for hours each day. They may also find a home beneath protective helmets and padding. Also, athletes often come into close contact with other players and their fungal environments, so the possibility of bacteria and fungus transference increases. In December, we blogged about football players who were picking up deadly MRSA bacteria from their practice turf. So how can athletes protect themselves? Remember, no matter the sport, the best offense is a good defense. 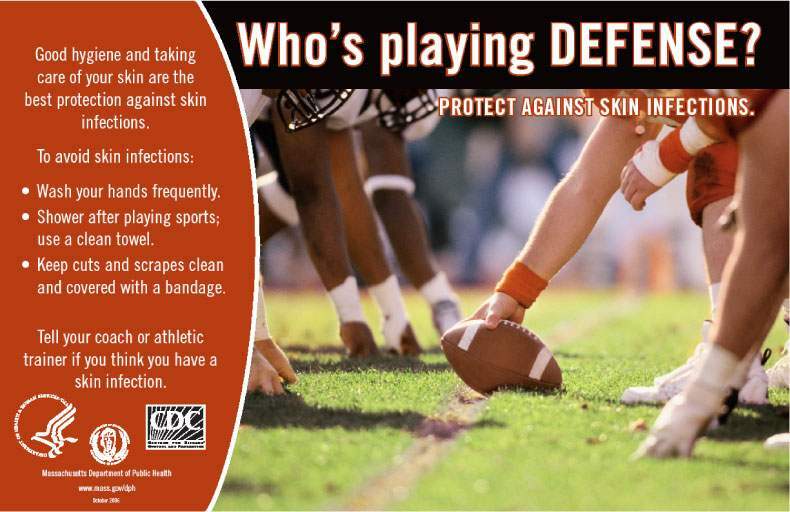 How Can Athletes Prevent Skin Infections? 1. Cover all cuts and scrapes with a bandage until fully healed. 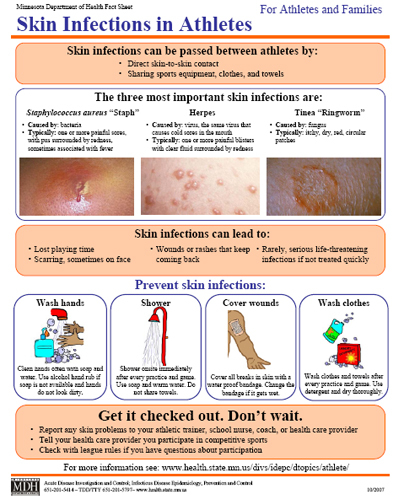 Openings in the skin can be a portal to infection. 2. Wear padding in areas that are prone to blistering, wear special socks, and be sure to buy the right size shoe. 3. Buy moisture-wicking clothes to keep the skin dry and discourage germ colonization. 4. Wear sandals or shower shoes in the locker room to protect yourself from picking germs up off wet floors. 5. Cleanse your entire body with antimicrobial soap after every practice and game. 6. Avoid sharing towels, washcloths, razors, combs, and soaps that can transfer pathogens from person to person. 7. Wash towels, clothing, and sports bags after each use to keep germs at bay. 8. Disinfect protective gear daily. 9. Check your skin regularly, looking for cuts, sores, swelling, tenderness, dry patches, or redness. 10. Never use sandpaper or bleach to pass a skin check. No one wants to end up with athlete’s foot, so beware of public showers. How Can Athletes Sanitize Their Shoes? Few pieces of equipment are more crucial to an athlete than their footwear. Whether the sport is football, tennis, hockey, basketball, soccer, or baseball, much depends upon an athlete’s ability to sprint, pivot, and move. Playing in the same shoes day after day can leave an athlete’s feet perpetually wet. This predisposes them to foot fungus (like athlete’s foot or toenail fungus) and bacterial skin infections. We recommend alternating shoes every other day, and placing a pair of shoes in the fresh air or near a vent to dry them out. We have also heard that pocket hand warmers work to dry out shoes. Drying the shoes is not enough to prevent the spread of infection. You also want to kill off the pathogens that have accumulated there. You can do this with the podiatrist-recommended SteriShoe UV shoe sanitizer. You can use the same technology hospitals use to kill 99.9% of the fungi, bacteria and viruses harbored in your footwear in just 45 minutes. Click here to see where you can buy an ultraviolet shoe sanitizer to help you prevent foot fungus and skin infections. Onychomycosis in the Spotlight: Toenail Fungus Featured on Television Show "The... Natural Healing: Can Neem Oil Be Used to Treat Pesky Foot Fungus?